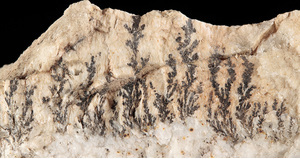 A lithium-rich granite pegmatite most famous for its manganese phosphates (Brush and Dana (1878, 1879, 1890)) and alteration of spodumene (Brush and Dana (1880)), which occurs in scattered crystals in a matrix of cleavelandite. 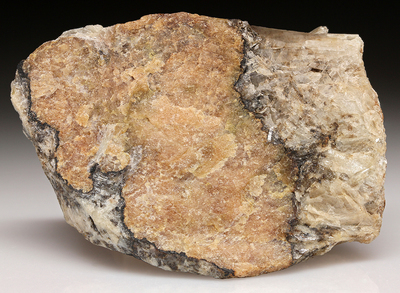 About 40 percent of the spodumene is unaltered; the remainder is altered in various degrees - by very fine-grained, parallel fibers of albite and eucryptite or by further alteration to “cymatolite” - fine-grained, parallel fibers of albite and muscovite. 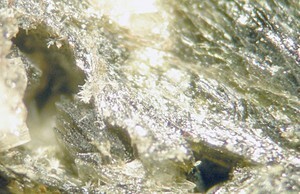 Extreme alteration resulted in replacement by yellow, fine-granular microcline or greasy, greenish "killinite" or "pinite". 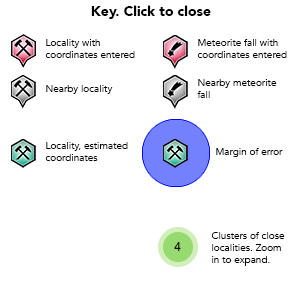 Individual crystals may show in cross-section a continuum of these states of alterations. 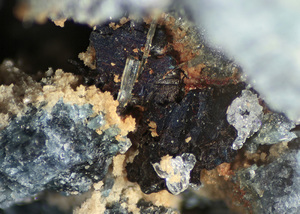 The manganese phosphates, of which lithiophilite is the most common, occur in rare, scattered concentrations within the cleavelandite-spodumene unit. 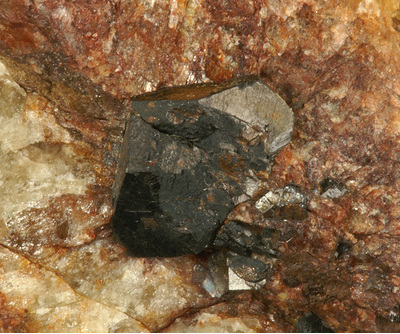 There are two kinds of concentrations: (1) those in which lithiophilite and manganapatite are the sole manganese phosphates, and (2) those in which three or more phosphate minerals are present. 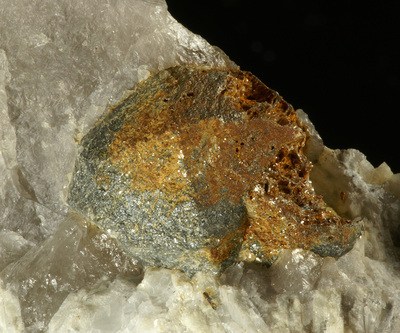 Yellowish-brown lithiophilite occurs in isolated ellipsoidal nodules ranging from ¼ inch to more than 1 foot in length. 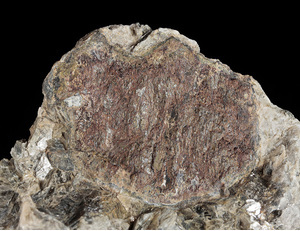 The nodules are invariably coated with bluish-black manganese oxide. The discoverer of the new minerals is controversial, but research by Januzzi (1997) indicates that original quarrier Abijah Fillow set some of the unusual minerals aside in 1876-7. In the late summer of 1877, James D. Dana took some of them back to Yale. The following year George J. Brush announced the discovery of a new mineral that the Reverend (and mineralogist) John Dickinson had found at the quarry in 1877. Following this, Brush and Edward S. Dana worked the quarry with Fillow for specimens of new minerals, and Dickinson donated additional specimens from his first visits in 1877. Clearly, both Dickinson and Fillow deserve credit and were given so with new mineral names. The property is owned by David Schornick of Branchville. The first excavation was made in 1876 by A. Fillow of Branchville, who quarried the pegmatite for mica, abandoning it before 1878. G. B. Brush and E. S. Dana, of Yale University, mined the pegmatite in 1878 and 1879 with funds furnished by Yale. The Union Porcelain Works of Greenpoint, N. Y., bought the property in 1880 and operated it for feldspar and quartz until at least 1890. The Bridgeport Wood Finishing Co. is reported to have operated it for quartz and feldspar prior to 1920. Fred and Joseph Burrough and Carlo Rusconi, all of North Branford, operated the mine for mica from September 1943 to November 1944. The Sandy Ridge Mica & Mining Co., 927 15th Street NW., Washington, D. C., worked the mine in November and December 1944. Januzzi (1997) reports that when the Union Porcelain Works operated the quarry in 1880-90 it was known as the Smith Mine. During that time three to four thousand tons of feldspar and four thousand tons of quartz were shipped. a few blasts [were] put in for sample purposes. Operations lasted only three weeks; the men were not paid and then all activities ceased; the quarry is once more filled with water and abandoned. 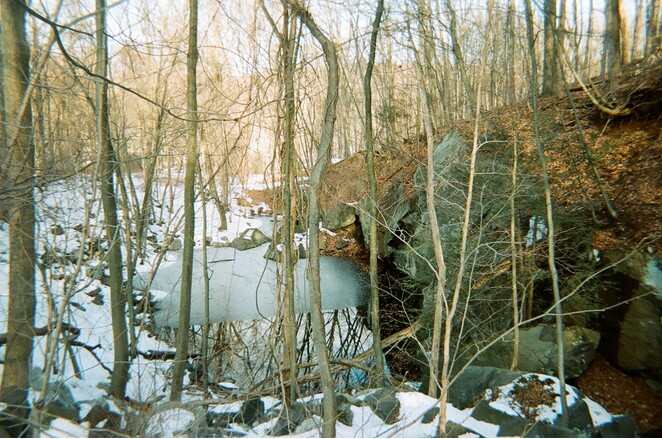 The quarry and underground workings have been inactive since 1944 and most of it is flooded. The main working (pl. 42) is an opencut 240 feet long, 50 to 85 feet wide and 60 feet in maximum depth. A crosscut 20 feet long has been driven into the north wall of the cut, and from this one drift extends 75 feet northwest and another 57 feet southeast. Both open cut and drifts are partly backfilled. About 2,300 tons of rock was moved between September 1943 and December 1944. 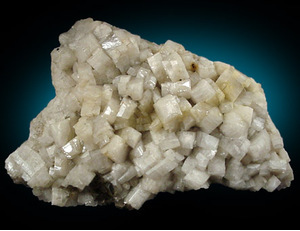 The pegmatite is composed chiefly of quartz and cleavelandite with subordinate muscovite. It has a striking internal structure. The following units are found successively inward from the wall: quartz-oligoclase zone, muscovite-quartz zone, cleavelandite-quartz unit, cleavelandite unit, cleavelandite-spodumene unit and quartz core. Another detailed description of the pegmatite's structure is given by Shainin (1946). In the late 1970s, an attempt was made to open the site to educational mineral collecting (as opposed to a mine or quarry). The town government decided such an operation should be regulated like a school, placing so many obstacles on what should have been a very simple program that the attempt was abandoned. Note that the quarry is located in the Town of Redding, but that the village of Branchville, situated immediately southwest of the quarry, is actually in the neighboring Town of Ridgefield. Because of the long history of the use of "Branchville" as a place name for this locality, it is included in the hierarchy. 68 valid minerals. 9 (TL) - type locality of valid minerals. 8 erroneous literature entries. Description: Besides a major constituent of the pegmatite, crystals in small pockets reach up to about 2 cm, often in dense clusters, also as overgrowth on microcline on cleavelandite and psuedomorphous after muscovite in the wall zone. Description: From Januzzi (1994): "Alluaudite, collected and recently identified by the author as occurring at Branchville (confirmation by Kampf, Los Angeles County Museum of Natural History), is evidently a pseudomorph after euhedral crystals of triphylite." Needs confirmation. Reference: Januzzi, Ronald. E. (1994): Mineral Data Book - Western Connecticut and Environs. Mineralogical Press, Danbury, Connecticut. 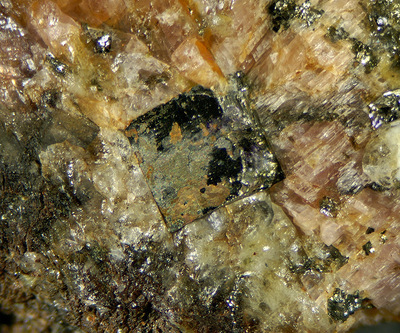 Description: small crystals a few mm concentrated in layers in the metamorphic rock around the pegmatite. Reference: Januzzi, 1976. Mineral Localities of CT and Southeastern NY State, p. 273. Description: Penfield's 1879 analysis of a Branchville specimen showed an OH:F ratio of 1.02, making this specimen montebrasite as now defined. Many references are not specific to species, back then all of the massive lithium phosphate of this series was generically called "amblygonite". It is now known that the amblygonite species is incredibly uncommon even in localities which have fluorite, massive fluorapatite, and topaz. Therefore, specimens from this locality are most likely montebrasite. Reference: Januzzi, Ronald E. (1959): The Minerals of Western Connecticut and Southeastern New York. The Mineralogical Press, Danbury, Connecticut. Description: Reportedly the carbonate-rich variety. In small pockets in cleavelandite. Description: columnar aggregates up to 2 feet long. Reference: Januzzi, 1976. Mineral Localities of CT and Southeastern NY State, p.228. Description: veins in the border zone, rarely as micro crystals in small pockets. Habit: Rhombohedra, also embedded grains in lithiophilite. Description: Extremely rare. Chemical analysis by Brush and Dana (1879b) show this material is chabazite-Ca of modern nomenclature. Their description is: "This species occurs of a dark yellowish to reddish brown color, in irregular masses disseminated though quartz, and sometimes imbedded directly in the green chloritic material, and also in the massive manganesian carbonate [rhodochrosite] occurring with the lithiophilite. A few small crystals 1/4 to 1/2 inch, were found in cavities." One specimen of these crystals remains in the Yale collection (025313). Massive material shows a resinous, translucent orange-colored cores with lighter colored aureoles. The article provides additional data regarding the mineral and a complete wet chemical analysis corresponding with the accepted limits of chabazite. Description: Crystals and groups reached “remarkable size”. Yale has crystals and groups to over 10 cm. 500 pounds were mined between 1880-90. Reference: Januzzi.(1976). Mineral Localities of CT and Southeastern NY State; Cameron et al (1954). USGS Prof Paper 255. 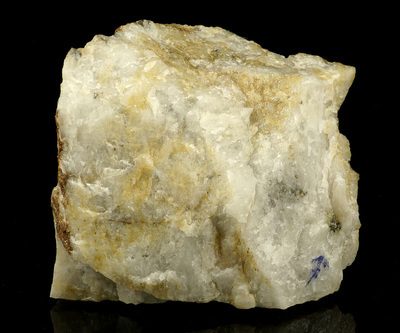 Description: oriented intergrowth of very fine-grained, elongated albite and muscovite. Grains are oriented perpendicular to the spodumene c axis and give a columnar, silky appearance to the inside of a fractured specimen. 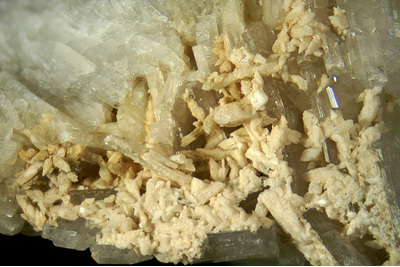 Crystals pseudomorphs after spodumene at Yale to 32 x 70 cm. Reference: Brush and Dana (1878). 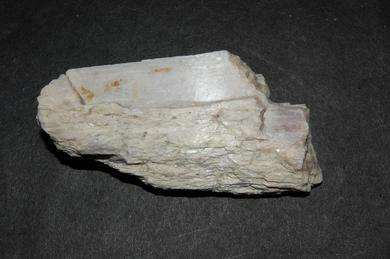 ; Shainin, V. (1946) The Branchville, Connecticut, Pegmatite. American Mineralogist: 31: 329-345.; Palache, C., Berman, H., & Frondel, C. (1951) The System of Mineralogy of James Dwight Dana and Edward Salisbury Dana, Yale University 1837-1892, Volume II: 671, 718, 855.; Moore, P.B., Ito, J. (1979) Alluaudites, wyllieites, arrojadites: crystal chemistry and nomenclature. Mineralogical Magazine: 43: 227-235.; Weber, Marcelle H. and Earle C. Sullivan (1995) Connecticut Mineral Locality Index. Rocks & Minerals (Connecticut Issue): 70(6) (November/December): 396-409.; Daltry, V.D.C. and von Knorring, O. (1998) Type-mineralogy of Rwanda with particular reference to the Buranga pegmatite. Geologica Belgica: 1: 9-15 (referring to Moore & Ito, 1979). 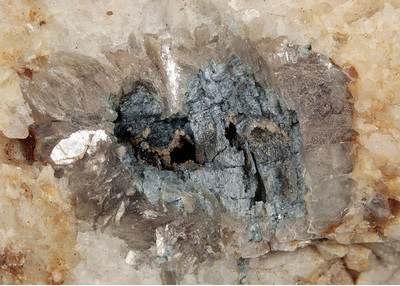 Description: A small ~1.5 cm nodule of massive blue elbaite, rimmed by muscovite, embedded in granular albite was found by Marcelle Weber in 1957. 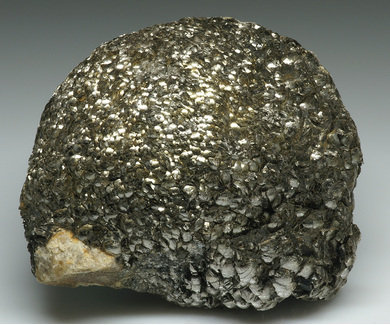 Labeled as "muscovite after triphylite". Despite the abundance of Li at this locality, this may be the only specimen of elbaite from here. 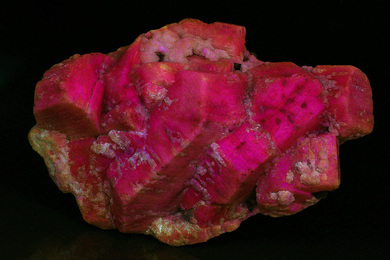 Description: Intimately associated with quartz, dickinsonite, triploidite and rhodochrosite. 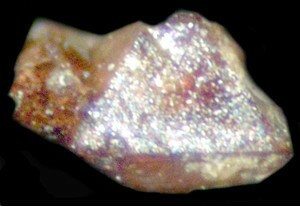 Pink, translucent, prismatic crystals to around 1 cm long show rough striae parallel to the long axis, associated with micro encrusting quartz and apatite. 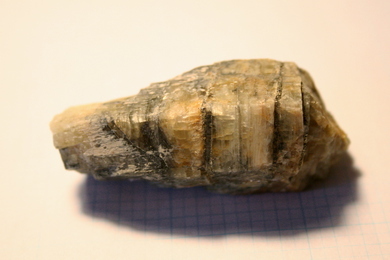 Description: oriented intergrowth with very fine-grained, elongated albite. Grains are oriented perpendicular to the spodumene c axis and give an indistinct fibrous to columnar structure, this being always at right angles to the adjoining surface of the original mineral. Fractured surface typically has a frosty appearance. 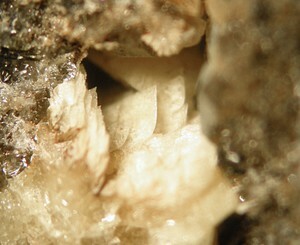 Description: One variety cccurs filling cavities in the reddingite, and covering the distinct crystals of this mineral. It is uniformly clear and transparent, and is highly lustrous, showing entire absence of even incipient alteration. It is generally foliated to lamellar, although sometimes of a somewhat radiated structure. A second variety occurs in masses of considerable size interpenetrated rather irregularly with quartz, and quite uniformly run through with thin seams and lines of a black manganesian mineral of not very clearly defined character. 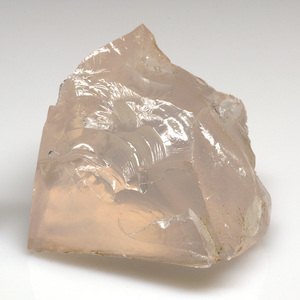 Typically friable to the touch and lacks something of the brilliant luster of the first variety, it also shows greater difference of structure, passing from the distinct crystals to the massive and radiated form. Also occurs in small particles in fillowite and in masses of some size immediately associated with eosphorite, triploidite, and dickinsonite. Description: Reddingite is very commonly associated with fillowite, and in many cases it is not easy to distinguish the two minerals. Description: Crystals frozen in matrix are generally subhedral and opaque, generally the paler colored crystals or portions fluoresce much better than the darker color. Micro crystals in pockets in albite can be clear, colorless and euhedral with bright yellow fluorescence that helps locate them. Also chabazite, quartz, and fluorapatite crystallized in cavities in rhodochrosite associated with clove-brown lithiophilite, quartz, fluorapatite, and dickinsonite. Description: Yellow coating on sphalerite. 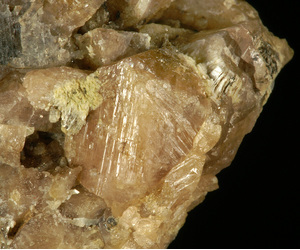 Description: Material labeled "gummite" in the Yale collection appears as yellow encrustations on cleavelandite and columbite. 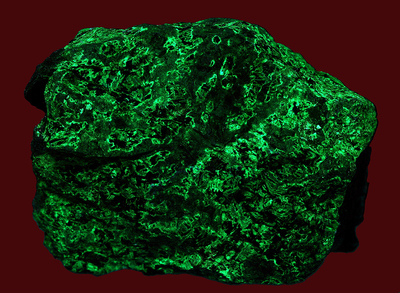 Portions fluoresce weakly or strongly in SW UV so appear more likely to be uranophane and meta-autunite. Description: The cited reference used by Seaman is false. 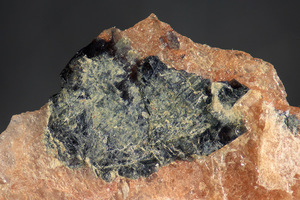 Lithiophilite may be leached and oxidized to purpurite. The process does not materially alter the Mn:Fe ratio of the parent material (Paulus Brian Moore, personal communication). Description: Despite this mineral's having been widely re-cited after Januzzi (1976) examination of Januzzi's only specimen shows that it merely consists of iron-stained angular albite crystals. The identification, based on the original specimen, was in error, although re-listed in Tschernich (1992). This mineral is NOT mentioned in: Shainin, V., 1946, The Branchville Connecticut, Pegmatite, American Mineralogist, v. 31, p. 329-345. Description: Massive, sub-resinous, white to pale material in the Yale collection reminiscent of massive scapolite. Tiny crystals in small vugs. 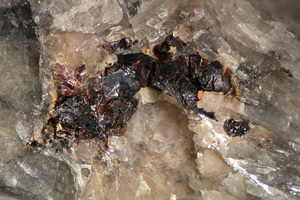 Formed from an alteration of lithiophilite, intimately associated with dickinsonite, eosphorite, fairfieldite, reddingite, fillowite, triploidite. Difficult to distinguish from reddingite. Description: Frosty, translucent, pale yellow micro crystals encrusting pocket quartz, cleavelandite, and a much larger, glassy fluorapatite crystal. 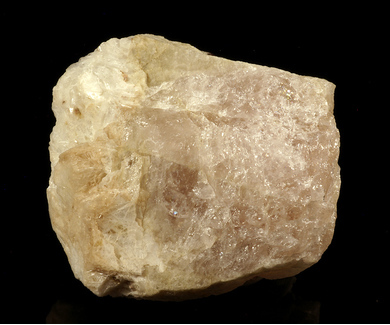 Originally labeled as calcite, but does not react to HCl, has hardness 5, no visible cleaveage, and does not fluoresce. 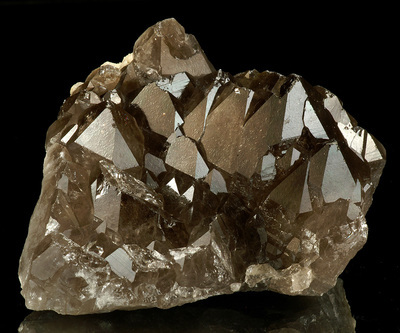 Description: "Landesite may occur as a dark brown alteration product of reddingite at Branchville." Description: In fractures and coating various minerals. 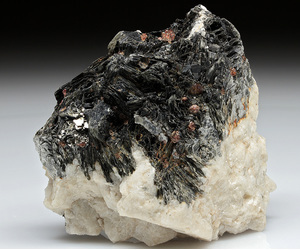 Description: "autunite" mentioned as an accessory by Cameron et al (1954), but probably dehydrated to meta-autunite. 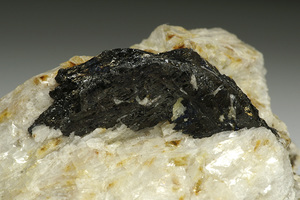 Material labeled "gummite" in the Yale collection appears identical to other specimens labeled "autunite". Description: Januzzi reported it as switzerite, which dehydrates to metaswitzerite according to Zanazzi (1986). Januzzi reference provides no details. Caption for http://www.mindat.org/photo-199679.html indicates confirmation by unknown methods. Reference: Zanazzi et al. (1986), Deyhdration from switzerite cf. American Mineralogist: 71: 1224-8.; Januzzi, Ronald E. (1976), Mineral Localities of Connecticut and Southeastern New York State. Taylor Associates - Mineralogical Press, Danbury: 235. 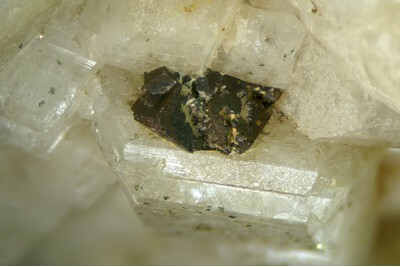 Description: "small, dark brown, octahedral crystals in albite (cleavelandite)"
Description: Greenish yellow coatings on the phosphate minerals in the Yale collection, some are labeled as mitridatite. Reference: Penfield, Samuel L. (1879): On the Chemical Compositon of Amblygonite. American Journal of Science. Series 3, Vol 18, pp. 295-301. Description: The "ball peen" habit of radiating, curved crystals is particularly well developed. 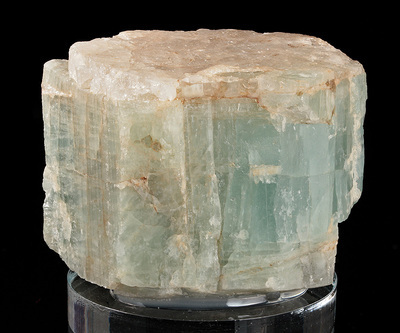 Tabular crystals range from 1 to 24 inches in diameter and 1/8 to 12 inches in thickness. Most of the books are about 5 inches in diameter and 1 inch thick. 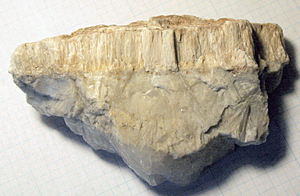 About 15 percent of the muscovite visible in the wall zone is pseudomoorphed by what appears to be albite and quartz. Perfect pseudomorphs after muscovite have been formed. The replacement was limited to certain parts of the zone; these are irregular in outline and appear distributed without relation to the original structural or mineralogical features of the zone. Within these parts practically all the muscovite adjacent to the wall rock contact, including that in the border zone, has been replaced, but mica in the inner one-third or one-fourth of the wall zone is mostly unaffected. Large books that extend across the full thickness of the zone grade from unaltered muscovite in the inner part to pseudomorphs in the outer part. Description: Brush and Dana (1878) (first paper) state that they found "a hydro-mica near damourite having a peculiar concentric spherical structure" [emphasis added]. They did not actually identify damourite. 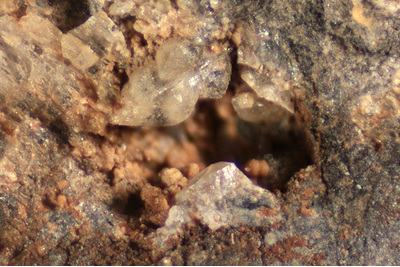 Description: Small regions within lithiophilite nodules. Description of type material from Brush and Dana (1890): "The luster is brilliant resinous to nearly adamantine; it was, in fact, the brilliancy of the luster which first attracted our attention, and which is, so far as the eye is concerned, its most distinguishing character. 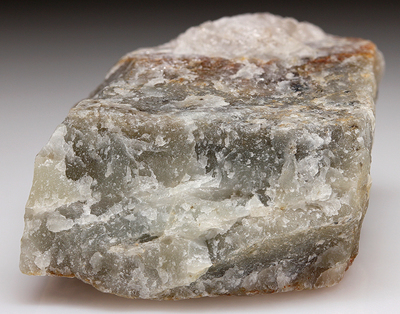 The mineral itself is perfectly clear and transparent, but the masses are much fractured and rifted. 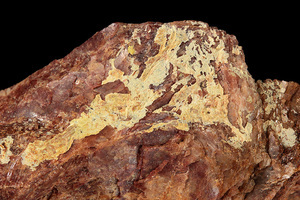 The surfaces are often covered by a very thin scale of an undetermined mineral, having a fine fibrous form, a delicate yellowish color and silky luster. This same mineral penetrates the masses wherever there is a fracture surface of cleavage or otherwise. What the exact nature of this mineral is we are unable to say, since the amount is too small to admit of a satisfactory determination - it appears to be a manganesian phosphate. It is evidently an alteration-product and would seem to imply that natrophilite is rather subject to easy chemical change. In any case this silky film is one of the characteristic features of the mineral, and directs attention to it at once even over the surface of a hand specimen where it is associated with lithiophilite and perhaps three or four other of these phosphates." Description: "Supergene alteration resulted in the formation of manganese oxide and purpurite from lithiophilite" Shainin (1946). 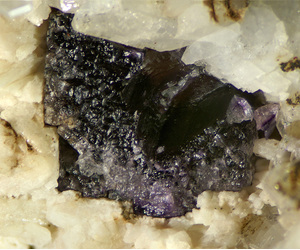 Yale collection has a few specimens that show purple coating on black exterior of altered lithiophilite nodules. Description: No manganese dendrite or staining in a granite pegmatite in the world has been verified as pyrolusite. The name was a mistake in the nineteenth century which has been widely publicized. 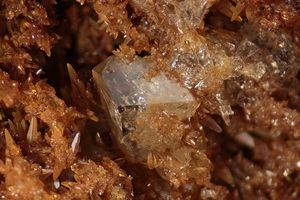 Description: Januzzi reports micros occur in cavities in cleavelandite associated with bismutite, wulfenite and cerussite. An inspection of his surviving material so far has not revealed this mineral, but there are yellow coatings associated with the above minerals that are more likely a secondary bismuth mineral. Description: thousands of tons of massive material mined, but crystals limited to micros in small pockets with albite. 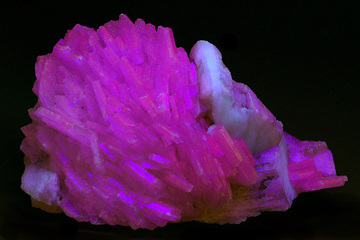 Also chabazite, quartz, and apatite crystallized in cavities in rhodochrosite associated with clove-brown lithiophilite, quartz, apatite, and dickinsonite. Description: From the type material description in Brush and Dana (1878): "Reddingite occurs sparingly in minute octahedral crystals; belonging to the orthorhombic system. It is also found more generally massive with granular structure; it is associated with dickinsonite, and sometimes with triploidite. 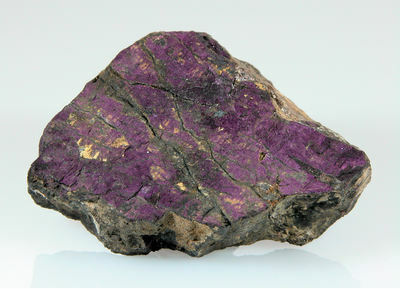 As compared with the other species which have been described it is a decidedly rare mineral. The massive mineral shows a distinct cleavage in one plane...crystals are occasionally coated dark from surface alteration" Difficult to distinguish from pink hureaulite or yellowish fillowite. 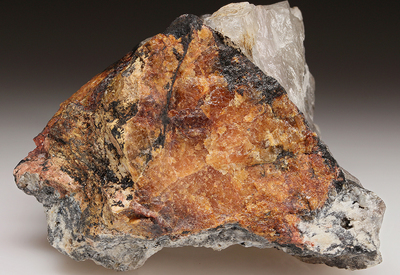 Description: Associated with eosphorite, dickinsonite, triploidite, quartz, also included in lithiophilite. 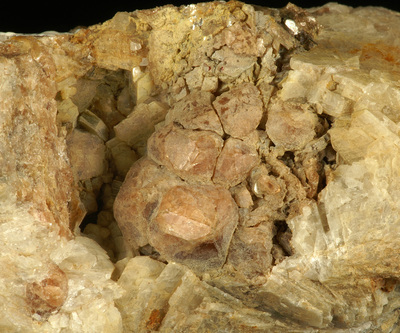 Also chabazite, quartz, and fluorapatite crystallized in cavities in rhodochrosite associated with clove-brown lithiophilite, quartz, apatite, and dickinsonite. Typically with black alteration crust. Reference: Brush and Dana (1878b, 1879a, 1879b); Shainin (1946): American Mineralogist 31: 329-345; Palache, C., Berman, H., & Frondel, C. (1951), The System of Mineralogy of James Dwight Dana and Edward Salisbury Dana, Yale University 1837-1892, Volume II: 718, 855, 938. 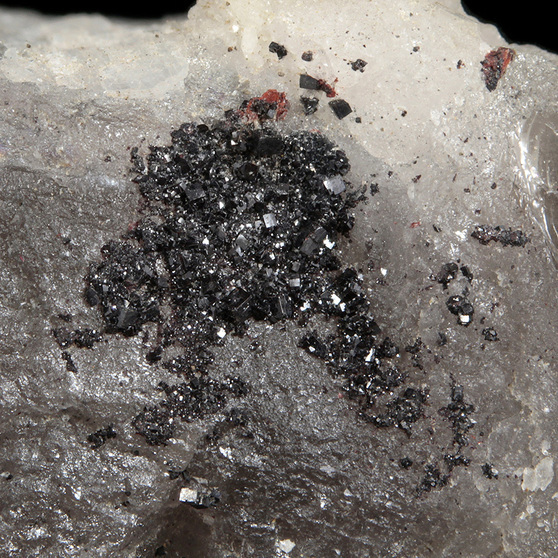 Description: Many references include "garnet" but none give a specific species except Januzzi who provides no analyses. 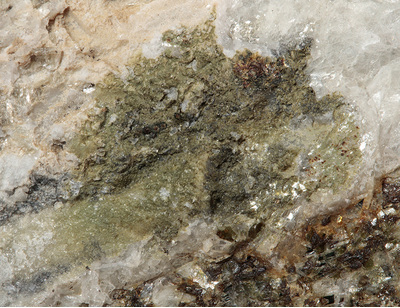 Spessartine is possible given the abundance of Mn minerals in this pegmatite, but so far it is unconfirmed. Description: Massive, resinous micro material in cleavelandite. Description: rarely as gemmy kunzite, usually white. The prisms average 1 foot long, 6 inches wide and 3/4 inch thick but can reach up to 3 or 4 feet long and 8 to 9 inches thick. 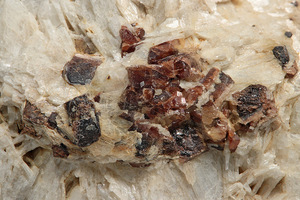 Much of it is altered to an albite/eucryptite parallel intergrowth mixture, to "cymatolite" (a parallel intergrowth mixture or albite and muscovite), to granular microcline, or to massive albite and muscovite - or a progressive combination of these replacements. Description: Usually in the unaltered core of externally altered cyrstals and only very rarely transparent. Reference: Januzzi, 1976. Mineral Localities of CT and Southeastern NY State, p.235. 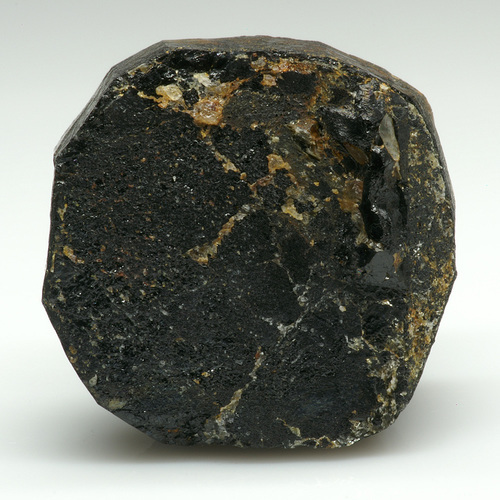 Description: Comstock (1880) analyzed scant material found by Brush and Dana with a gravity of 6.5, almost no Fe, and niobium to tantalum atomic ratio of 1:1.04 making it just barely tantalite-(Mn). 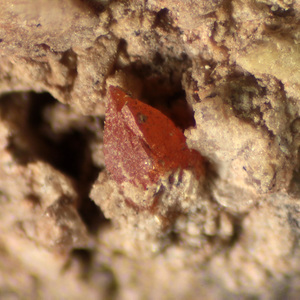 Maroon, translucent micro crystals in cleavelandite. 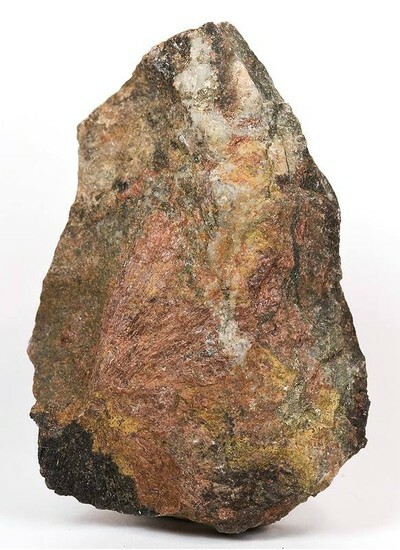 Description: In Januzzi (1994) he mentions topaz "reported as a single occurrence; additional information is needed concerning the authenticity of the find". 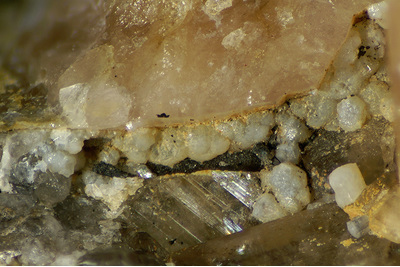 In a specimen formerly in his collection are a few glassy, colorless, complexly terminated microcrystals identified as topaz, found in voids a very fine-grained cleavelandite matrix partly filled with calcite. 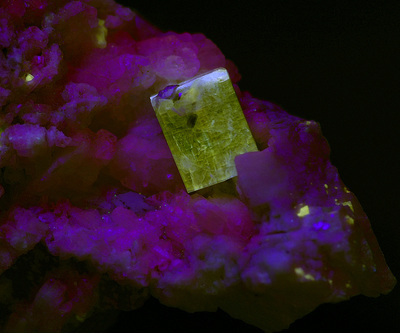 But when examined under SW UV light, they fluoresce the typical bright yellow-white of fluorapatite. They also do not show the perfect basal cleavage of topaz. Reference: Januzzi, Ronald. E. (1994) Mineral Data Book - Western Connecticut and Environs. Mineralogical Press, Danbury, Connecticut. 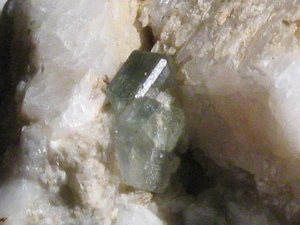 Description: "green tourmaline" mentioned by Cameron et al (1954) in the border zone of the pegmatite. Description: At least one 12 x 15 mm crystals, collected by Ronald Januzzi and certainly visually appears to be a triphylite, though rather mottled within, and he considered it pseudomorphed by alluaudite. In Januzzi (1994) he writes: "Alluaudite, collected and recently identified by the author as occurring at Branchville (confirmation by Kampf, Los Angeles County Museum of Natural History), is evidently a pseudomorph after euhedral crystals of triphylite." Needs confirmation. Description: Brush and Dana (1878) established the presence of triploidite and compared it to triplite but noted the absence of fluorine. In 4 detailed papers on the various Mn phosphates they do not mention that triplite actually occurs there. Reference: American Mineralogist (1946): 31: 329-345; Palache, C., Berman, H., & Frondel, C. (1951), The System of Mineralogy of James Dwight Dana and Edward Salisbury Dana, Yale University 1837-1892, Volume II: 851. Description: mostly columnar, fibrous, radiating, rare isolated but typically vitreous and transparent crystals to a length of an inch or more. 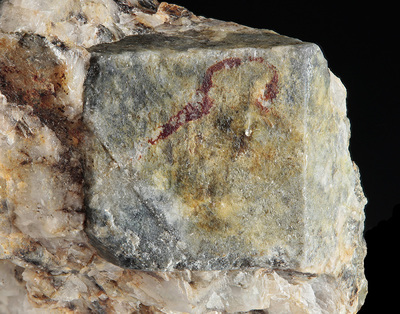 Associated with quartz and the other Mn phosphates and rhododchrosite. 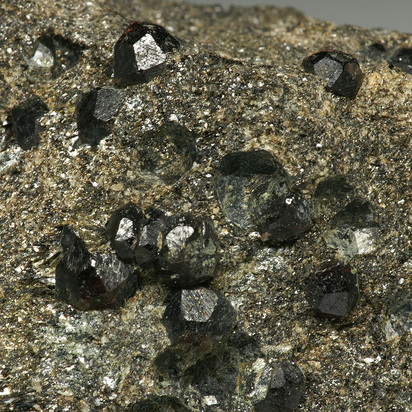 Description: uraninite "in brilliant black octahedrons" associated with lithiophilite, fluorapatite, garnet, uranium phosphates, and cyrtolite. Crystals used in several early radiometric daughter product and age dating studies. 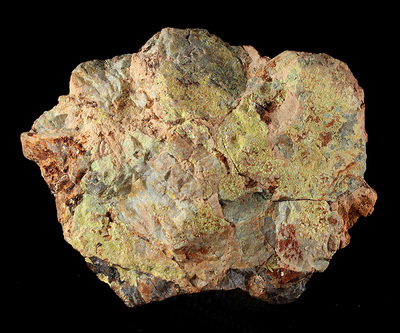 Description: mentioned by Brush and Dana (1879) as "a silicate containing uranium". 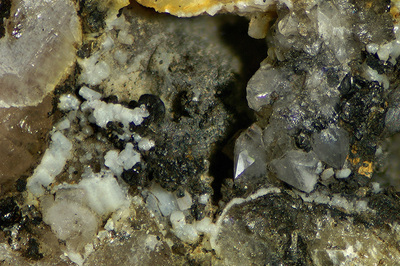 Specimens labeled "gummite" and "autunite" in the Yale collections are similar appearing coatings on cleavelandite and columbite. 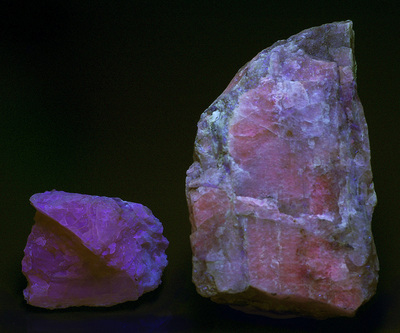 Portions fluoresce strongly and weakly under SW UV and so are more likely meta-autunite and uranophane, respectively. 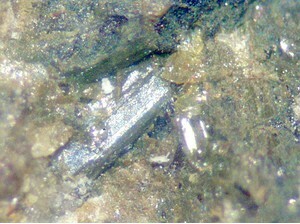 Description: In thin layers as an alteration of lithiophilite and reddingite and as micro crystals, minute amounts. 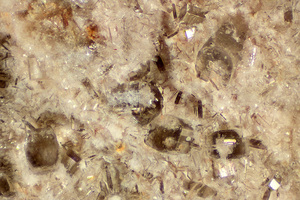 Some seen on altered lithiophilite nodules in the Yale collection. 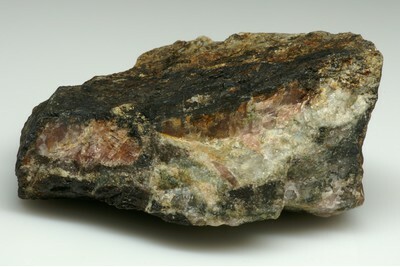 Description: (Including local terms Ansonia, Mine Hill, "Tyler Lake," "Siscowit") - White, light-gray, buff, or pink, generally foliated granitic gneiss, composed of sodic plagioclase, quartz, microcline, muscovite, and biotite, and locally garnet or sillimanite. 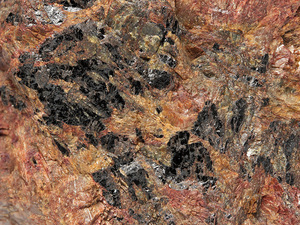 Commonly contains numerous inclusions or layers of mica schist and gneiss. Comments: Part of Central Lowlands; Iapetus (Oceanic) Terrane - Connecticut Valley Synclinorium; Ansonia Gneiss is here referred to as Ansonia leucogranite. On the basis of field and laboratory studies, Ansonia, Beardsley, Pumpkin Ground, and Shelton gneisses, previously considered stratigraphic units, are reinterpreted as plutonic. 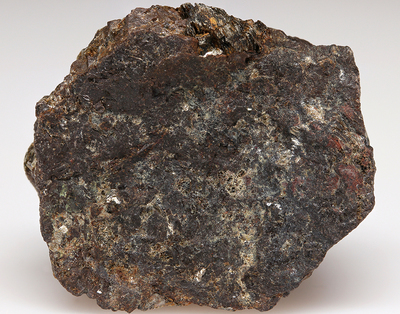 Ansonia is described as a strongly lineated and moderately foliated, fine-grained, garnet-bearing, biotite-muscovite leucogranite with a well-developed granoblastic texture. Intrudes Beardsley and Pumpkin Ground orthogneisses. Maximum age from zircons is 417+/-1.5 Ma. Conservative interpretation of isotopic data is crystallization between 393 and 419 Ma and therefore, authors assign an age of 406+/-13 Ma (Late Silurian to Early Devonian) to the Ansonia (Sevigny and Hanson, 1993) per CT007. Brush, George J. and Edward S. Dana (1878) Notice of three new Phosphates from Fairfield County, Connecticut. American Journal of Science: s. 3, 15: 398-399. Brush, George J. and Edward S. Dana (1878) Notice of a fourth new Phosphate from Fairfield Co., Connecticut. American Journal of Science: s. 3, 15: 481-2. Brush, George J. and Edward S. Dana (1878) On a new and remarkable mineral locality in Fairfield County, Connecticut; with a description of several new species occurring there. First Paper. American Journal of Science: s. 3, 16: 33-46, 114-123. Brush, George J. and Edward S. Dana (1879) On the Mineral Locality in Fairfield County, Connecticut, with the description of two additional new species. Second Paper. American Journal of Science: s. 3, 17: 359-368. Brush, George J. and Edward S. Dana (1879) On the Mineral Locality in Fairfield County, Connecticut. Third Paper. American Journal of Science: s. 3, 18: 45-50. Penfield, Samuel L. (1879) On the Chemical Composition of Amblygonite. American Journal of Science: s.3, 18: 295-301. Comstock, W. J. (1880) Analyses of Some American Tantalates. American Journal of Science: s. 3, 19: 131-2. Comstock, W. J. (1880) On the chemical composition of the uraninite from Branchville, Connecticut. American Journal of Science: s. 3, 19: 220-222. Penfield, Samuel L. (1880) Analyses of some Apatites containing Manganese. American Journal of Science: s.3, 19: 367-369. Brush, George J. and Edward S. Dana. (1880) On the Mineral Locality at Branchville, Connecticut: Fourth Paper. 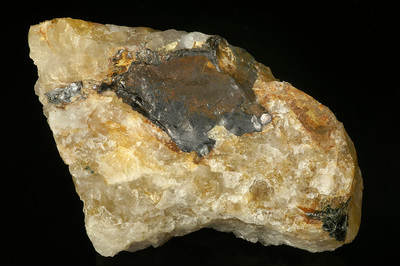 Spodumene and the results of its Alteration. American Journal of Science: s. 3, 20: 257-285. Penfield, Samuel L. (1883) Analyses of two varieties of lithiophilite (manganese triphylite). American Journal of Science: s. 3, 26: 176. Brush, George J., Edward S. Dana, and Horace L. Wells (1890) On the Mineral Locality at Branchville, Connecticut: Fifth Paper; With analyses of several manganese phosphates. American Journal of Science: s. 3, 39: 210-216. Hillebrand, W. F. (1890) On the occurrence of nitrogen in uraninite and on the composition of uraninite in general. American Journal of Science. s. 3, 40: 384-394. Boltwood, B. B. (1907) On the ultimate disintegration products of the radioactive elements. American Journal of Science: s. 4, 23: 78-88. Schairer, John F. (1931) Minerals of Connecticut. State Geological and Natural History Survey of Connecticut Bulletin 51. Elwell, Wilbur. (1937) Some Old Localities in Connecticut. Rocks and Minerals: 12(9): 270-1. Cameron, E N., Larrabee, D. M., McNair, A. H., Page, J. J., Shainin, V E., and Stewart, G. W. (1945) Structural and economic characteristics of New England mica deposits. Economic Geology: 40: 369-393. Shainin, V. (1946) The Branchville, Connecticut, Pegmatite. American Mineralogist: 31: 329-345. Palache, C., Berman, H., & Frondel, C. (1951) The System of Mineralogy of James Dwight Dana and Edward Salisbury Dana, Yale University 1837-1892, Volume II: 851, 876, 938. Sohon, Julian A. (1951) Connecticut Minerals. State Geological and Natural History Survey of Connecticut Bulletin 77. Cameron, Eugene N., Larrabee David M., McNair, Andrew H., Page, James T., Stewart, Glenn W., and Shainin, Vincent E. (1954) Pegmatite Investigations 1942-45 New England; USGS Professional Paper 255. Neues Jahrbuch für Mineralogie, Monatshefte (1957): 78. Januzzi, Ronald E. (1959) The Minerals of Western Connecticut and Southeastern New York. Mineralogical Press, Danbury, Connecticut. Jones, Robert W. Jr., (1960) Luminescent Minerals of Connecticut, A Guide to Their Properties and Locations. Fluorescent House. Branford, Connecticut. Schooner, Richard. (1961) The Mineralogy of Connecticut. Fluorescent House, Branford, Connecticut. Henderson, William A., Jr. (1975) The Bertrandites of Connecticut. Mineralogical Record: 6(3): 114-123.
errors listed in Januzzi and Seaman (1976) Mineral Localities of Connecticut and Southeastern New York State and Pegmatite Minerals of the World. Mineralogical Press, Danbury, Connecticut. Ryerson, Kathleen H. (1976) Rock Hound’s Guide to Connecticut. Pequot Press. Marcin, Edward J. 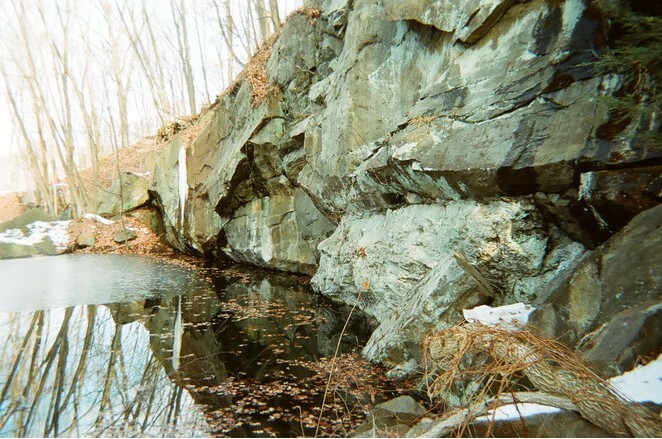 (1981) Branchville, Fairfield County, Connecticut: A Classic Mineral Locality. Rocks and Minerals: 56: 67-69. Zanazzi et al. (1986) Dehydration from switzerite. American Mineralogist 71: 1224-1228.
minerals listed in error in Tschernich, R. (1992) Zeolites of the World. Geoscience Press, Phoenix: 114. Januzzi, Ronald. E. (1994) Mineral Data Book - Western Connecticut and Environs. Mineralogical Press, Danbury, Connecticut. Weber, Marcelle H. and Earle C. Sullivan (1995) Connecticut Mineral Locality Index. Rocks & Minerals (Connecticut Issue): 70(6) (November/December): 396. 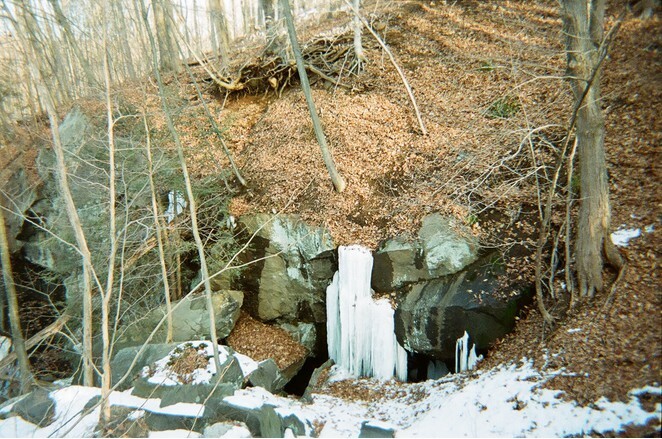 Januzzi, Ronald E. (1997) The Branchville Quarry and the Dickinson/Fillow Controversy. Mineralogical Press, Danbury, Connecticut. Vajdak, Josef (1999) New Mineral Finds in the First Half of 1999. Mineral News: 15(7): 2, 4. 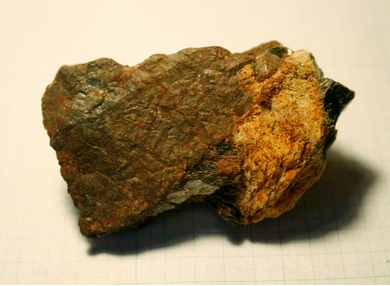 Vajdak, Josef (2000) New Mineral Finds in the Second Half of 2000. Mineral News: 17(1): 1, 4, 5.